A seasonal tradition on par with annual December broadcasts of It's a Wonderful Life , 1965's A Charlie Brown Christmas is not just one of the most beloved holiday themed titles of all time but the Peabody Award winning smash is also the most celebrated and successful made-for-television animated special ever made. Yet most likely because it set the bar so high for animated programming -- as popular as the forty-five year old thirty-minute program may be -- few fans realize that the seemingly effortless hand-drawn work with Vince Gualardi 's now instantly recognizable musical score of piano infused jazz, was in fact the first ever televised adaptation of Charles M. Schulz 's cherished Peanuts comic strip. However, because there's an old adage warning that lightning doesn't strike in the same place twice, those behind the scenes have never taken its historical impact for granted, churning out numerous Charlie Brown follow-ups centering around a variety of topics from sports to Snoopy... but avoiding Christmas at all costs for thirty years. And while I haven't seen 1992's It's Christmastime Again, Charlie Brown , unfortunately all the nostalgia in the world for the superior original work can't salvage Schulz and company's third yuletide endeavor via 2002's Charlie Brown's Christmas Tales . Aside from the familiar feel and groovy Gualardi accompaniment, there's not much to recommend this work which uses the holiday itself as the one unifying thread to attempt to piece together a handful of otherwise unrelated vignettes separated with Christmas card-like inserts from Linus, Lucy, Sally, Snoopy and Charlie Brown. And because the characters and our affection for them are so rich in our hearts, the Tales have their moments. Yet ultimately by playing it safe rather than trying to involve us in an actual storyline, overall it's a disappointingly dull eighteen minute effort. Moreover, Tales is easily and quite surprisingly usurped by this DVD's bonus special, the 1983 program Is This Goodbye, Charlie Brown? that feels timelier than ever in our uncertain economy as Charlie Brown risks losing his best friend Linus and inexpensive psychiatrist Lucy when the two discover they might have to move to another town after their father gets transferred. The emotional divide between working fathers and their children extends into another recent Warner Brothers' holiday themed animated DVD re-release of 1982's terrific made-for-TV title Yogi Bear's All-Star Christmas Caper . 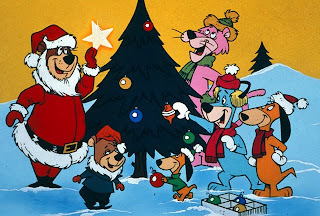 Essentially a Hanna-Barbera send-up of Miracle on 34th Street , Yogi and Boo-Boo interrupt Ranger Smith's plans for a peaceful winter of bear hibernation at Jellystone Park by journeying into the big city to spend time with their “All-Star” animated friends from the company's universe of characters including Huckleberry Hound, Snagglepuss, Quick Draw McGraw and more. When they get their wires crossed and the gang ends up at Jellystone, Ranger Smith gets wise to Yogi's scheme. Once they travel into town, Smith and Yogi's pals discover that – after briefly posing as a department store Santa -- Yogi has befriended an adorable young girl whose only wish for Saint Nick is for her wealthy Donald Trump-like father to spend time with her during the holiday season. Obviously, it isn't the world's most original plot-line but it's much more thoroughly entertaining than Charlie Brown's Christmas Tales since this time around, the feature attraction was better than the bonus feature. Likewise, while needless to say, the excessive “walk-ons” (or actually “draw-ins”) of Hanna-Barbera characters tends to detract from the flow of the work since we're distracted by the sight of Fred Flintstone and Barney Rubble who appear onscreen for no apparent reason, it's hard to find fault with this particular Caper . Not only is the DVD special's heart in the right place but it boasts a beautiful message of family togetherness and is just flat-out Yogi Bear fun.